Home » For Organizers » #Hack4good with King Tides Project! King Tides Project International is a collaborative network with limited resources and a lot of heart. Organizers around the world are stewards of their coastlines and coastal communities in a way that most people are not: we aim to see and prepare for the future. The King Tides Project is a citizen science initiative that invites coastal shoreline loving citizens to document the visual impacts of extreme high tide events. These events demonstrate future average water levels with sea level rise due to climate change. More importantly, citizens have the opportunity to share the reality of this coming future circumstance with people who are charged with preparing for it: our scientists, policy makers and decision makers. Like other citizen science initiatives, participation is directly related to ease of engagement. And ease of engagement is linked to resonance (is this something people care about) as well as accessibility. Each of the regional organizers has “made-do” with tools such as flickr, instagram, twitter and Facebook to collect and share images. While these tools do well to connect to the peers of our photographers, they don’t meet the needs of our scientists or decision makers so much. The King Tides Project is seeking the help of application developers around the world to solve this problem. 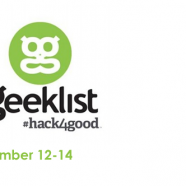 Geeklist #hack4good is a global “hackathon” or app development initiative that invites technology experts and creative thinkers to solve climate change related problems with technology solutions. Here is our problem statement on #Hack4good. Can you think of other tools that would ease participation in King Tides Projects? We are open to your ideas on how to make our project even better! We’re looking forward to the creativity of the global #Hack4good team! Read about our challenge to global #Hack4good participants.